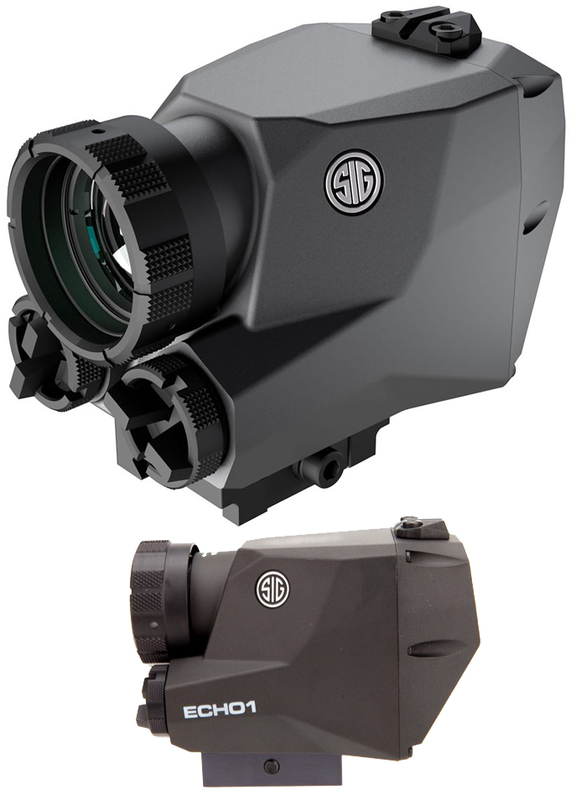 ONE OF SIG SAUER'S latest developments is the 1-2x30mm ECH0 1 Digital Thermal Imaging Reflex Sight. The unit is priced at $2,500, which sounds astronomical until you start looking at the competition. Unlike night-vision devices, thermal sights can be operated during the day or night. They provide a high degree of target recognition out to a few hundre d yards for small game and as far as 500 yards for deer-sized animals — farther if either is moving. The ECH0 1 night sight is designed to be firearm-mounted using its integral Picatinny rail mount allowing easy universal weapon mounting. This means the unit has been ruggedized to sustain the repeated shock that a firearm transfers to the optic through recoil, unlike fragile handheld-specific monoculars. The device is small enough to fit in a cargo pocket, allowing it to pull double-duty as a handheld model. It can even capture still photos. ABOVE LEFT : ECHO 1 adjustments are electronically controlled, with the exception of the objective diopter. ABOVE MIDDLE : The sight is powered by a pair of CR123A batteries for up to eight hours of continuous use. 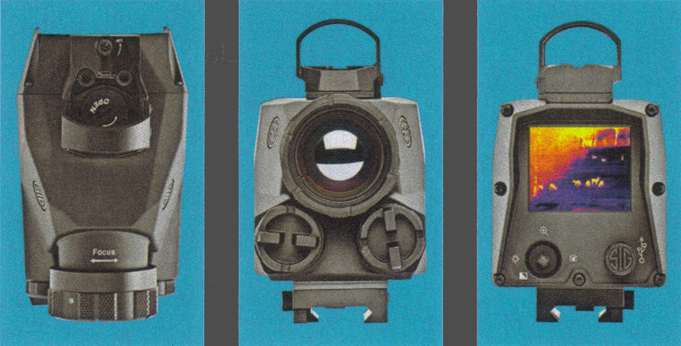 ABOVE RIGHT : The ROMEO 1 red dot sight can be mounted atop the ECHO 1 unit. What sets the ECH0 1 apart from nearly every other direct-view thermal optic on the market is the ability to mount SIG Sauer's ROMEO 1 miniature red dot sight on top of the unit. 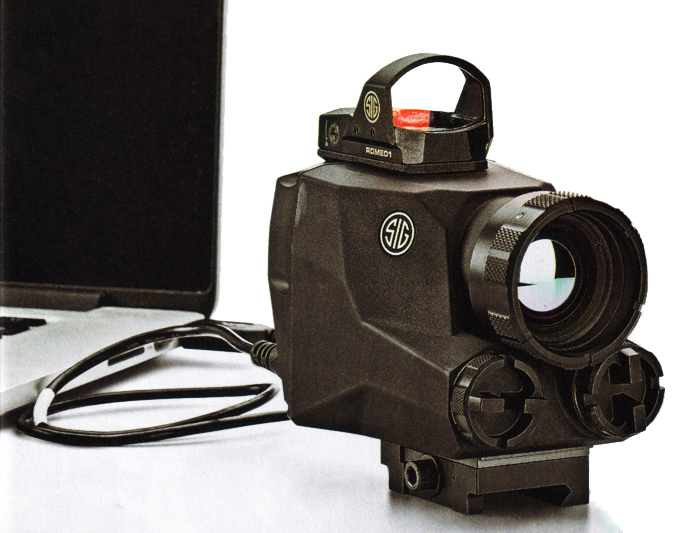 During daylight hours, or in combination with a white light at night, the package can be used like any other red dot sight. The ROMEO 1 will also allow you to scan and lock onto a target much faster than the thermal alone. If you think you see a potential target, shoulder the rifle, place the red dot, and then simply glance down at your thermal to identify and engage. The system is quick. If you choose not to spring for the $275 ROMEO 1, the ECH0 1 comes with a peep sight that resembles the rear sight of a pistol to help with daytime alignment. Once the optic powers up, the user can toggle through an intuitive menu (similar to those found on digital cameras) to select a particular option . Four shortcuts allow you to zoom in or out, capture images, switch thermal color modes and adjust brightness control. Pressing the joystick inward brings you to the main menu, allowing you to zero the sight, choose a reticle (or create and download your own at sigsauer.com), review images, etc. The ECH0 1 zeroes easily using a piec e of black tape on a light-colored target backer.